"Talk about thrills, chills, spills, and wills. You got 'em all and we are in awe of your accomplishment." Near the beginning of the steep drop off the South Peak of Kinsman Mountain on Day 117. Thanks, Aaron! Jim and I both had a few of each of the "ills" above, mostly in New Hampshire and Maine! I've said that if I knew then what I know now (e.g., how hard those last two states would be), I might never have had the courage to begin my journey. In that regard, I'm glad I didn't know! Once I got there and found out, it would have taken a major disaster to prevent me from finishing because I was so close to the end. On the other hand, knowledge is power. If I'd fully realized how rugged and dangerous the last two hundred miles would be, I probably would have flip-flopped north halfway through the run while I still had energy, was well-conditioned from the mountains in Georgia, North Carolina, Tennessee, and Virginia, and had longer hours of daylight to complete some of the long roadless sections in northern New England. It's too late now for me to do that, but readers contemplating thru-hikes or runs might be able to benefit from my hindsight. There are plenty of thrills and chills in the lists below of what I consider to be some of the toughest climbs and descents along the Trail and other dangerous places I discovered. Hopefully, others won't have as many spills as I did. Your wills will be tested throughout the journey, I guarantee - whether your goal is going end-to-end in one season or tackling smaller chunks one at a time. Hang in there and have fun!!! You're tougher than you think you are. TOUGHEST CLIMBS AND DESCENTS ON THE A.T. I whined about some of the steep climbs and descents in the southern half of the AT before I knew what steep really meant! Perspective. Kinda like bouldering, I found out that it was "all training for Maine" (and New Hampshire). These steep and/or long climbs are listed in order of south to north, not in descending order of difficulty. A word of caution: these climbs and descents are challenging fun if the rocks are dry and you aren't in too big of a hurry. If they are wet, either avoid them entirely or go very slowly and be extremely careful. Your life literally depends on it! 1. Port Clinton, Pennsylvania - the northbound (NOBO) descent to this town began gradually for a couple miles, then dropped precipitously in the last quarter mile from 1,300 feet to 400 feet. I had read in hikers' journals about the difficulty of this steep, rocky drop but was still surprised because it was the worst descent I'd encountered on the AT up to this point. It was not only steep, but also slick with loose rocks that behaved like ball bearings among the numerous rock water dams and steps. See Day 73. 4. West and Bear Mountains, New York - both of these mountains also have loose rocks that act like ball bearings on the descent, going northbound. I managed to fall twice. The reward at the bottom of Bear Mountain is getting to run or hike right through the middle of a wonderful little zoo! Neither hill would be as dangerous going up because you'd have better traction. Day 95. 5. Caleb's Peak and St. John's Ledges, Connecticut - at this point, I still wasn't very experienced with super-steep downhills. I stopped to take a deep breath at the top, but my heart was racing the whole way down. Despite the installation of ninety rock steps it's still a treacherous descent going NOBO because of the pitch and the distance between the rocks. As with many of the other steep climbs and drops on the AT, I can't imagine anyone negotiating this descent with a big backpack. The AT guide says these cliffs are used frequently for rock-climbing instruction. See, I told you it was steep! Uphill would take your breath away in a different manner, but would be kinder to your knees. Day 99. 6. Jug End, Massachusetts - Jim met me part way up this steep descent near the end of the section I did on Day 100 saying, "You're crazy!!" I responded, "You should have seen the top part of this drop!" Jug End has a nasty descent of about 1,000 feet in a mile on rock verticals and high "steps" that tested my range of downhill save-the-knees techniques. Meanwhile, everyone knew this was still just a warm-up for New Hampshire and Maine. 7. Mt. Greylock Massif, Massachusetts - long, steep, difficult descent going northbound with 2,900 foot drop in about six miles. The massif includes Saddle Ball, Greylock, Fitch, and Williams mountains. The steepest part is the 2,300-foot drop from Williams to the town of North Adams in less than three miles. All of it is rocky, rooty, and slick with loose rock. Are we ready yet for the White Mountains?? See Day 105. 8. Mt. Moosilauke/Mt. Blue, New Hampshire - Jim and I tackled this monster southbound so I wouldn't have to go down it (steep downhills were harder on my knees than uphills). Jim did an out-and-back on Moosilauke, so he got to experience the free-fall back down, too. There is a 2,600-foot elevation gain (or loss, if you're NOBO) in two miles - that is steep. 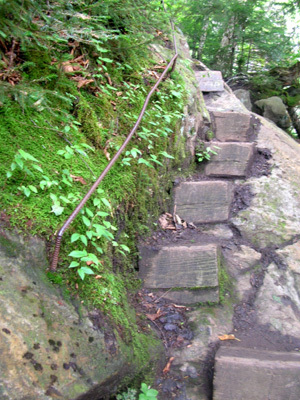 The footing is rugged, with some wooden "steps" and metal hand-holds on the worst vertical rocks (see photo below). A wild creek with numerous waterfalls and cascades serenades you as you're going up or down. See Day 116. 9. South Peak of Kinsman Mountain, NH - I managed to choose a wet-weather day (#117) to hit this awful drop going southbound and there was no bad-weather alternate route. Can you say "suicide slabs?" This was another one of those heart-in-my-mouth scary descents from the summit on exposed bedrock. I managed to fall on the slick rocks, but thankfully some shrubs kept me on the mountainside (see photo at top of this page). 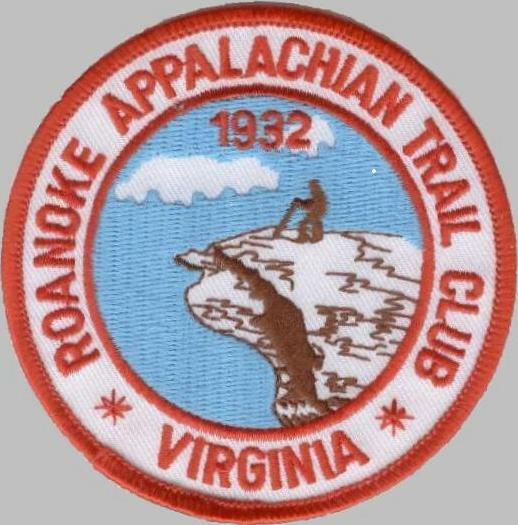 The AT guide even warns hikers about this one. Do this one northbound on a dry day. The only reason I went south was because there was no parking for Jim to wait for me at the north end of the section I ran that day. 10. Mt. 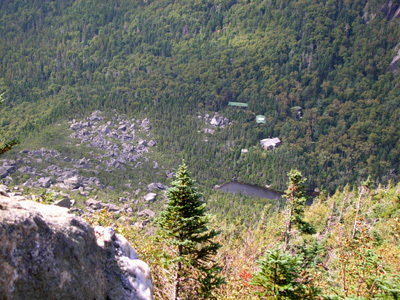 Webster, White Mountains of NH - this 2,700-foot ascent going north from Crawford Notch includes 2,000 feet up in two miles with some exposed rock and climbing required. The valley views are marvelous, taking your mind off the strenuous climb. See Day 120. 11. Mt. Madison, White Mountains, NH - the fourth steepest climb up or down on the entire AT is the north side of Madison, with a 2,000-foot elevation change in about one mile. Much of the footing is rugged, too. Based on what I'd read about this drop, I chose to climb UP, going southbound from Pinkham Notch. Either direction, you'll be real glad when it's over. It's not dangerous weather-wise until you get above tree line in the boulders. There's a photo closer to the bottom of this page that I took just above tree line on Madison. See Day 121. 13. Success, Mahoosuc Arm, and Old Speck in Maine - the Mahoosuc Range also has some tough climbs, particularly these mountains that I did northbound in dry weather on Day 127. There was 6,700-foot elevation gain and 8,300 foot loss over nineteen miles that day, making it even tougher than Day 125. The steepest climbs/descents were on Success Mountain (800 feet up in less than a half mile mid-way uphill) and Mahoosuc Arm (1,400 feet up the south side in about a mile). Neither is exposed, but the south side of Old Speck is. Jim did an out-and-back on Old Speck, so he got the exposed rock cliffs in both directions. He's not likely to forget that day! The climb up is steep. Going down the north side is more gradual and mostly in the trees, but the 2,685-foot drop in just over three miles is still memorable (as are the roots). 14. 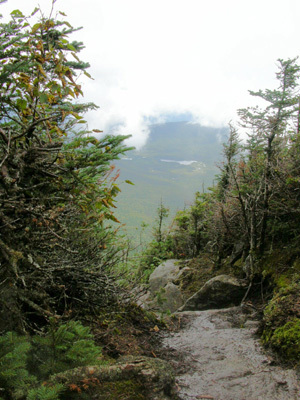 Baldpate West and East Peaks, Maine - going north, Baldpate has a 2,185-foot climb in three miles with a steep ascent for a mile, then a leveling for a mile as the trail traverses the side of the mountain, then another steep mile to the peak. This climb reminded me of the grunt through Mahoosuc Notch with all of its rock slabs, large rocks to climb over, and roots. The 1,532-foot descent on the north side of the second peak in less than two miles was also quite steep. On Day 129 in this section there was a 6,400-foot elevation gain and loss in only ten miles - good training for most any mountainous ultra! 15. Moody Mountain, Maine - going NOBO there is a fairly steep 1,030-foot climb in a little over one mile with very few switchbacks. Getting up Moody, however, was much preferable to getting down the other side, one of the worst downhill sections I've run into on the AT. Not only was it steep, it had very rugged footing, lots of large step-downs, wooden ladders, and several metal hand- and foot-holds on nearly-vertical walls of rock. The only way I could go down the metal "steps" was to do it backwards. The rocks below are very steep, although they don't appear that way in this photo. See Day 130. 16. Old Blue and Bemis Mountains, Maine - the 750-foot rise in the first half mile on Old Blue sure got my attention! This is reach-out-and-touch-the-trail-in-front-of-you steep. 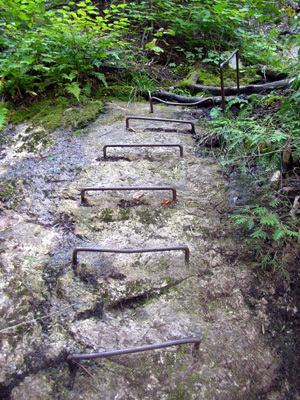 It was also narrow, overgrown, and rugged, with large steps and metal rungs required to negotiate the rocks. The climb became more gradual and moderate the next mile and a half, then was steep again with lots of rock slabs the last half mile to the peak of Old Blue. The total gain here was 2,190 feet in three miles. 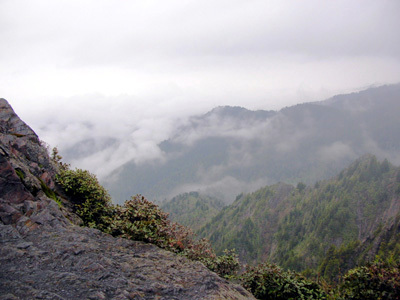 Soon afterwards is a 1,000-foot drop, sometimes quite steep, from the north side of Bemis Mountain to Bemis Stream. See Day 131. 17. Sugarloaf Mountain, Maine - so here I am on Day 134, nearly 2,000 miles into this adventure run, and I describe the northbound descent of this mountain as one of the worst yet. That should tell you something! 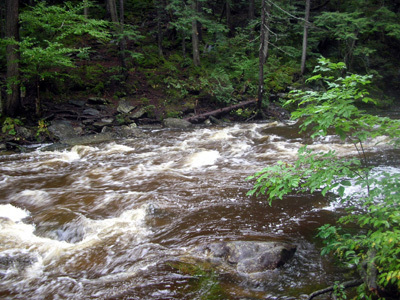 Not only is there a 1,700-foot drop over two miles down to the South Branch of the noisy Carrabassett River, but 1,000 of those feet are in about 2/3 of a mile and include a huge boulder field and rock walls to slide or jump down. I was a very happy lady when I successfully completed that descent and the nerve-wracking rock-hop across the river. As usual, this would be strenuous going up (southbound), but oh, so much easier on the knees and psyche. 18. Mt. Katahdin, Maine - reputed to be the mother of all climbs and descents on the entire AT. I agree, but I was ready for it after nearly a million feet going up and down hundreds (thousands?) of mountains the past four months. 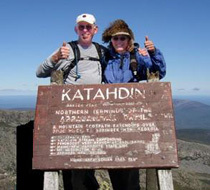 The official 5�-mile AT route (Hunt Trail) to the summit from Katahdin Stream Campground climbs 4,200 feet. The steepest, most difficult part is halfway up, starting near the tree line. Everything you've learned about climbing boulders and rock walls is put to the test here. The last two miles (a plateau called the "Tableland" and the last 800 feet of ascent) are the easiest - sweet reward for reaching the top. 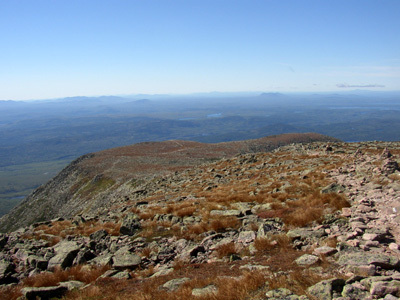 Next is a view of the plateau from the summit. You can clearly see the steep pitch on the left compared with the easier grade on the "Tableland:"
Some alternate trails are supposedly a little easier than others but all of them put you at a different finish than Katahdin Stream CG at the bottom, which is a problem if you don't have a vehicle at the end of the trail you're descending! 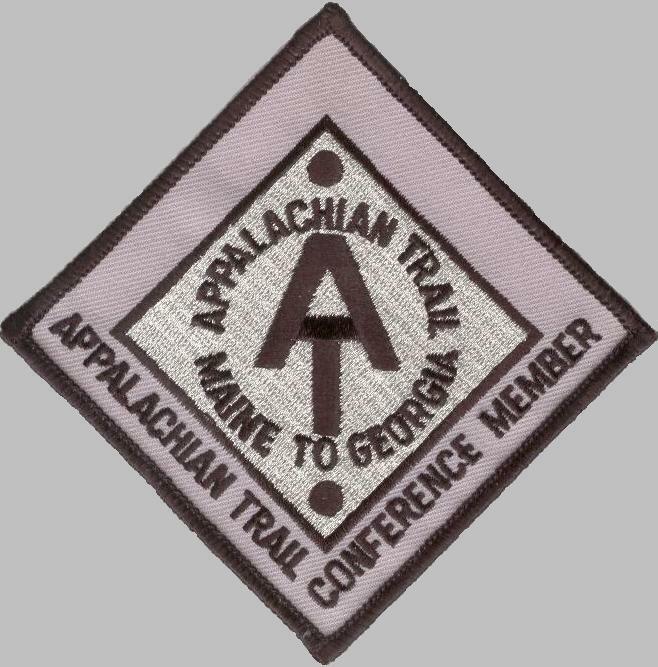 The closest alternate trail to Katahdin Stream CG is the Abol Trail, which ends two miles down the road at Abol Campsite. Reported to be easier than descending the Appalachian Trail, Jim and I decided to descend by this route and just run the road back to Katahdin Stream. This was NOT an easier trail by any means!!! The descent is actually steeper than the AT (same drop in a shorter distance from the plateau). The two advantages (which some may question) are coming down through more boulders and scree than rock walls, and being able to run more below tree line. As if I haven't already mentioned plenty of places to get seriously injured or die, here are some more general and specific locations along the AT where you need to be very cautious. I just went back to read Prep #11, where I discussed health and safety issues before hitting the Trail. Very interesting! I was aware of many of the dangers I'd face, but not all of them. Some I had to discover for myself. Mentioning them here will hopefully serve as a warning to others. 1. Busy 4-lane highways with no pedestrian bridge, light, or even warning signals - sad to say, two of the worst road crossings are in northern Virginia (my home state) and were both on Day 58: Hwy. 50 at Ashby Gap and Hwy. 7 at Snickers Gap rattled me because they were nearly blind crossings near curves on roads with traffic going 60 MPH or more. Hwy. 11/30 in Vermont on Day 107 was similar. There are more crossings like these in other states, too. 2. Railroad tracks - plenty of these to cross, too. The most dangerous are the triple tracks heading north out of Duncannon, PA just before the ascent to Peters Mountain (see Day 69). Although I was subsequently wrong about which railroad tracks in Duncannon were the site of a hiker's death soon after I was there, these are still the worst tracks to cross on the entire AT. 3. Treacherous bog boards - I can't count how many times I fell off those suckers. I learned to avoid as many as I could that were on drier ground (some you have to walk on). I tried to be as environmentally sensitive as I could possibly be while on the Trail, but after several falls I decided if the doggone trail maintaining clubs didn't maintain safe log crossings where they don't want you to damage the plants, it wasn't my fault if some plants got stepped on! It is not safe to cross many of these rotten, narrow, broken, very slick, teetering, sloped, or canted-to-one-side logs and boards. 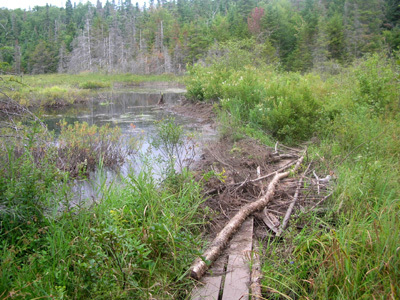 This is another variation of the problem - where beavers have built a dam on TOP of the boards! Bogs, swamps, and wetlands are, well, wet. So the boards are often wet even if it hasn't been raining. They get slimy but you can't always see the slime - kinda like black ice. And they are every bit as slick as black ice. It is safest where there are two parallel logs or boards so you have a 50-50 chance of one foot having some grip. The single ones that are only five or six inches wide are most dangerous, even when dry, flat, and in good repair. Heading north, bog boards start in New Jersey, I believe. The very nicest ones are in the Pochuck Swamp - actually a mile-long elevated boardwalk that cost beaucoup dollars. Bog boards (AKA puncheon) increase in frequency and state of disrepair the farther north you go, except for Maine. They are in better repair there, although that's where I encountered the one in a deep swamp that rolled from side to side and almost threw me off! The most narrow, exposed ridge I saw was the Knife Edge on Katahdin, but it's not on the official AT route. There is a photo of it on Day 148. 5. Any bald or mountain above treeline when it is foggy, raining, sleeting, snowing, or so windy it knocks you off your feet - this one is pretty obvious, but even cautious Sue proceeded on Day 117 in the Kinsmans and especially on Day 121 on Mt. Madison when I probably shouldn't have. (I had my reasons!) I never encountered lightning on a peak, fortunately, but had trouble standing up in the high wind on Madison and Whitecap Mountains (Day 144), could barely see the blazes and cairns on Madison in the fog (Whitecap, Moosilauke - Day 116 - and the Kinsmans were marked more clearly), and had trouble negotiating ice-covered rocks on Madison after the sleet began freezing. Folks used to the higher elevations out West are familiar with the warnings about sudden storms and temperature drops in the mountains. Those warnings apply to the "lower" mountains in the East, too. You're just as vulnerable to the elements above tree line at 4,000 or 6,000 feet on the AT as you are at 12,000 or 14,000 feet in the Rockies. Trust me on this one. 6. Streams (which can include wide rivers) in New Hampshire and Maine after several inches of rain - I'll betcha if I ever get Alzheimer's Disease (a likely scenario, since my mother and probably her sister had it) I won't ever forget Day 141, when I chose to cross four murky, waist-to-chest-deep raging rivers and creeks after several inches of rain fell overnight in the Hundred-Mile Wilderness in Maine. The trauma and drama of that day are firmly etched in my mind and are still causing occasional nightmares nearly a month later. It wasn't like we weren't warned. Flooding is not as big a deal in the other twelve states. They tend to have more (and more civilized) bridges than New Hampshire and Maine. Of course, they are routinely damaged by massive flooding sometimes. There was one bridge still out in southern Virginia and I chose to follow the white blazes and ford the river anyway instead of taking a road and bridge offered as an alternate route. If the river had been too deep, I could have back-tracked, but it was OK. There are very few bridges across the numerous creeks and rivers in New Hampshire and Maine. I don't know if this is an economic, environmental, or macho decision, but it is reality. Heaven forbid there are any hikers out on trails this week in that area. There is currently serious flooding in both states, much worse than in the middle of September when I encountered flooded streams. 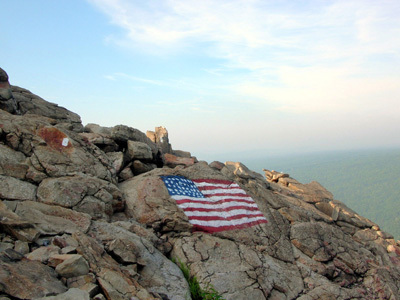 BOTTOM LINE: the AT is fraught with perils, but I'll never regret running and hiking it. After overcoming so many obstacles, I feel entitled to bragging rights for life. As I said in Prep #11, Don't let your fears stand in the way of your dreams! OK. Enough gloom and doom! The next entry will cover some of the most runnable (or easiest hiking) sections of the AT and my top picks for scenic beauty. I'll try to get that entry posted on or before Monday, October 17 (we get the most web site hits on Mondays, probably because folks dislike working that day! ).